PHOTO BY PAT GAIETTO Carey's Gavin Woods runs for a touchdown while being chased by Seneca East's Andrew Daniel and Kainon Ruffing. CAREY — They measure just about every form of football progress in yards, but on the play that meant the most here Friday night, the difference was a matter of inches,Carey outscored Seneca East 26-21 in an incredibly wild fourth quarter and came up a winner on an onside kick challenge to gain a 46-41 season-ending win over the Tigers. “I thought they played really hard,” coach Todd Worst said of the Blue Devils, who finished the year 6-4 overall and joined the Tigers and Colonel Crawford in a three-way tie for second place in the Northern 10 Athletic Conference behind unbeaten champ Wynford. “That was one the first times this year where we actually got a couple turnovers (three interceptions and a fumble recovery) go our way, a couple of bounces here and there and that’s just what it took to get us over the hump, I think,” Worst said. The two teams went into the fourth period tied at 20-20 after the Blue Devils overcame a stunning 80-yard touchdown run by Seneca East’s Brock Martin to start the second half. 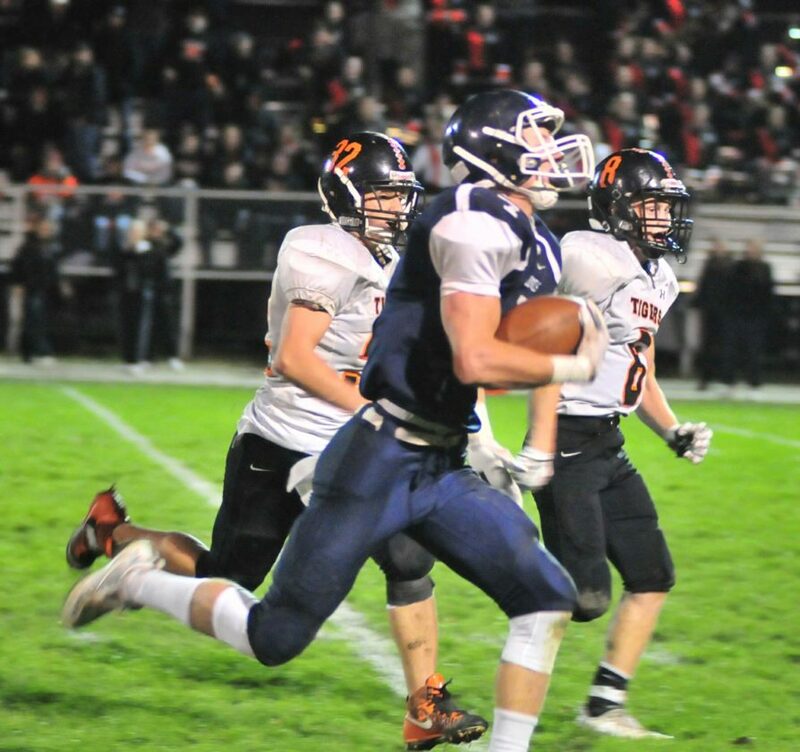 Carey gained the tie when Jonathon Racheter ran 4 yards to finish a 12-play, 62-yard drive to answer. That was part of a showdown of sorts between Martin and Racheter. Martin piled up 328 yards in total offense, rushing for 238 and three touchdowns on 21 carries and adding 90 receiving yards, including a 64-yard score. Racheter had 197 yards on 25 tries with two touchdowns and also caught a pass for 18 yards. The two teams were trading scores at a quick rate in the fourth beginning with Gavin Woods’ 27-yard TD run for Carey after a blocked punt. That came with 11:01 to playThe Tigers countered by going 65 yards in three plays, the score coming on Martin’s 26-yard run. Tyler Turek’s PAT kick made it 27-26 with 10:02 to go. Back came Carey with Racheter matching Martin’s 80-yard scoring run, one in which he broke away from two potential tacklers at the 30. That put the Blue Devils on top at 32-27. The defense responded when Jacob Stover recovered a fumble on the Blue Devil 26. Moments later, Carey had a 40-27 lead after Woods (133 yards, 10 carries) ripped off a 59-yard scoring run. But Seneca East wasn’t finished. The Tigers responded with a 50-yard drive with Bo Smith, who hit a couple key passes for first downs, going in from the 9 to trim the margin to 40-34. Then came the big play as Turek’s bouncing onside kick was seemingly recovered by teammate Jared Gurney. But the officials ruled Gurney had touched the ball just before it traveled the required 10 yards and possession was awarded to Carey. Racheter broke off a 34-yard run to set up quarterback Brayden Wentling’s 1-yard sneak for a breathing room score at 46-34 with 1:42 left. Smith hit Martin on a 64-yard slant to bring the Tigers back to within five with 55 seconds left, but Garrett Billock fell on the next onside kick to seal it for Carey. “You have to give them all the credit in the world, because they played really good football,” Phillips said of the Blue Devils. “You saw two teams tonight play really good football. They made a play or two more than we did to win the game.”Martin and Smith each scored touchdowns for Seneca East in gaining a 13-12 halftime edge. Wentling ran for a score and tossed a short TD pass to Cody Luzader for another. Seneca East stands 8-2 and has gained a playoff berth for the second straight year. The Tigers are expected to face Defiance Ayersville in next week’s opening round. “I told our kids all year that we’re going to be a great football team and I believe we are right now,” Phillips said. “This (loss) is going to go away real quick for me and this team because what we want is right there on the table in front of us.